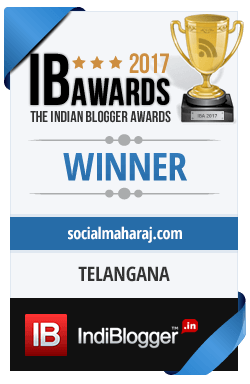 Hyderabad is famous for many things, be it the iconic Charminar or the delicious Biryani or the Hyderabadi Baigan ke Baata. The city and the people have that unique ishtyle that would make you to spend some extra time in the city when on a visit. The city is known for its Nizami Cuisine which is a mixture of Mughlai and Arabic cooking style along with the local Telugu cuisine. The Hyderabadi cooking style focuses more on the ingredients – right type with a distinct taste and aroma. Telugu cuisine (Andhra as I would say) is more about spices. So any Andhra dish you come across would look vibrant and would be on the spicy side. And one of the best places to have some great Andhra food is Abhiruchi. Abhiruchi is a restaurant in Madhapur (behind InOrbit mall) [They say there are no branches !] so beware of other Abhiruchis 😉 And the reason I’m writing this is because of the amazing meals I just had there. The restaurant is heavily crowded during lunch hours (12-4pm) and getting a seat is a herculean task. There is no waiting system whatsoever. It’s more of a first come first serve basis, you see an empty seat, you grab it before anyone else does. Considering the crowd, the restaurant seems small and congested. You are eating and few others are standing beside you waiting for you to finish. So, ideally enjoying the meal during the lunch hours isn’t possible. Further the place doesn’t accept cards, so make sure you take enough cash to fill yourself. One of the good things is they have a separate take away counter. Also even with the parking space it’s way too less to cater the high footfall during the peak lunch times. Talked too much about the restaurant, moving on the food. 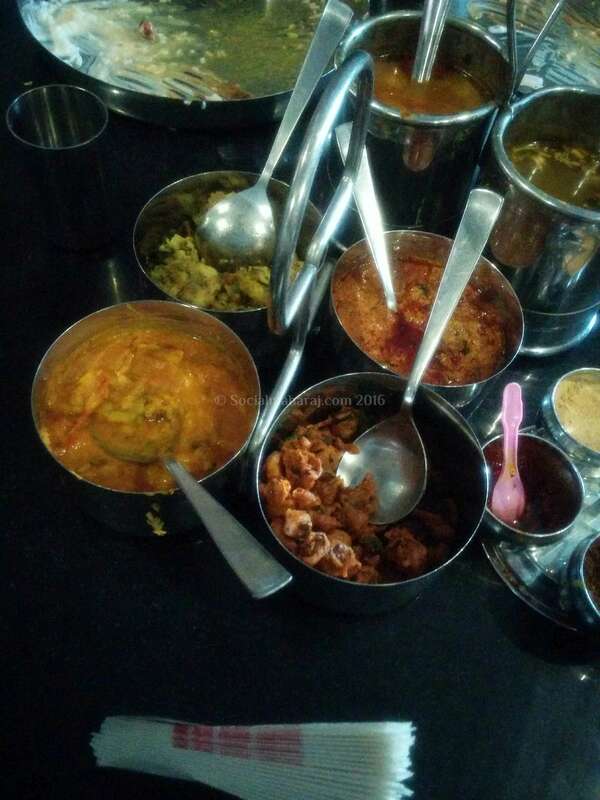 Since it was lunch time and because I prefer the typical mess-type-unlimited-thali stuff, we ordered 5 thalis. Abhiruchi is know for its Non Veg preparations including Kheema and Biryani, but we decided to leave for next time 😉 This was the first time I came to know that thalis are always veg (until unless specified) The waiter quickly got 5 plates with some Jeera Rice, pickle, curd and papad. Fry, Curry, Sambhar and Rasam. So for 100 Rs (excluding taxes) each, the Veg. Thali at Abhiruchi was definitely worth every penny. Be it the delicious curry or the rice, everything was just perfect for a decent lunch. 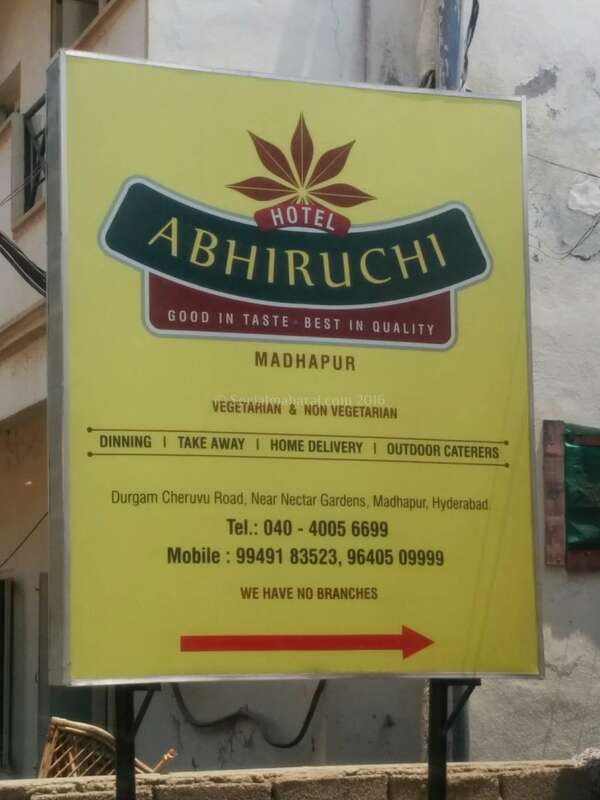 My suggestions, if you are posted in and around Madhapur, then you should definitely try out Abhiruchi at least once.